Bars, Restaurants, and Breweries, Oh my! Construction consideration begins before you even ever sign a lease. You want people who not only know how to build restaurants but who knows what matters to you and can support your goals. Building a restaurant is a huge undertaking! Our team has over 25 years of restaurant, bar, and brewery experience and we know how stressful and hard it can be. We pride ourselves in being a general contractor that can support you from start to finish from operations tips, to kitchen layout, vendor management, preconstruction, and launch. We are there for you during the whole journey. If you’re just getting started, this series may be just the ticket! In Part 1: The Nuts and Bolts of Building a Restaurant we dive into a holistic overview considering the big four: The People, The Places, The Budget, and The Schedule. Keep in mind, we’re based in Denver, Colorado so pricing and timeline could vary based on your location and timing—construction pricing changes rapidly every year. Buckle up and read on! The People | Get a good team on board early. Building a restaurant requires a complete understanding of back of house and front of house operations from the very beginning. While the whole process is incredibly cyclical and evolving, having a good grasp on the big picture as well as minute details (like what’s on the menu!) can have a huge impact on the entire project. That’s a lot to ask at the beginning! Thus, choose an architect construction team (and any consultants) who are well versed in restaurants and get them on board early! Choose one who has time in their company’s work load to really serve you well. Consider there are a plethora of health department and unique building code requirements when building a restaurant, you want partners who will get this right for you. The key? The earlier you get your people together in the same room the better. If you’re hiring engineers and/or consultants, we recommend you choose ones with lots of restaurant experience. Deciding whether or not to use a kitchen design consultant is an important factor in the design process. The menu drives equipment and the equipment drives MEP drawings. We often see three common pitfalls with restaurant clients: (1) Not allocating enough budget; (2) Not reviewing the restaurant’s equipment requirements and planning for the right pieces of equipment, thus ending up with incorrect or extra items; (3) Not involving the kitchen designers early enough. Kitchen design companies are experts in equipment and kitchen flow efficiency and they provide very specific equipment power/rough-in requirements—crucial information for the mechanical, electrical, and plumbing drawings. This information is necessary and critical at the beginning to ensure accurate construction drawings are produced for the construction team. So I know you’re thinking so far, this sounds fairly simple. However, owners/restaurateurs are responsible for managing a whole slew of additional vendors, from equipment suppliers to security, to audio/visual, point of sale systems, beverage services, beer tap systems, specialized lighting, small wares, menu design, signage (exterior and wayfinding) and furniture. It’s a lot to manage especially when you’re still navigating and planning funding, business plans, operations, weekly construction meetings and staff hiring. Let us help you lighten this workload—as restaurant specialists we’ve managed this for dozens of owners and seek to make the experience for you seamless. Get folks on board early. We cannot reiterate this enough. With your architect and general contractor and consultants on at the very beginning of the design phase, we have the ability to support you more holistically through the preconstruction process, which includes discovery, site survey, scheduling and budgeting. For helpful tips on choosing your team, check out our other blog post “Building Your Construction Team.” Having expert eyes on existing conditions can save much needed headache and money down the line. Which leads us to the next section: The Place. Side Note: It’s totally up to you as the owner whether you want that team to work in tandem (Design-Build) during design of the restaurant, or have construction documents prepared by the architect before handing them off for bidding, budgeting, and building with the general contractor (Design-Bid-Build). The word “design” can also somewhat be a misnomer—it really refers to the process of an architect creating the drawings of the restaurant. How will it flow? Where is the front door? Where is the kitchen, dining room, flow of egress? Interior design happens concurrently but is a smaller piece of the “design” process. Your architectural drawings are created in multiple stages rather than all at once such that changes/refinements happen more seamlessly. Once you have Construction Documents (the last stage) or “CDs” then in general you are ready for permitting and construction! The Place | Conduct a site survey to identify existing conditions. Whether you’re preferred restaurant location is a brand new building or an existing space needing renovation, conducting a site survey and understanding existing conditions is critical. At the beginning stages of discovery, it is worthwhile for you and your architect to hire mechanical, electrical, and plumbing engineers to survey your site. This will save you money and time during the construction phase. You need to know what your infrastructure is like prior to committing on a space. You’ll likely incur some fees during this phase, but the information gained at this early stage is very important to answer questions about whether or not the space is right for your planned use. Here’s a handy list of items to consider and check for during your site survey. Not checking for these could add anywhere from $15-$100K right off the bat. Most restaurants require a 4” minimum waste line. If not, we’d recommend considering another building or space altogether. Does the building have Landmark Protected status? If so, this adds an extra layer of review and thus, added time before permitting can even begin. If a multi-story building, where are the grease duct and refrigeration lines running? Is there good access for future deliveries to the back of the house? Where will the truck park to pump out and service the grease trap? Will you have a CO2 supplier or a need for CO2 tanks? If so, how accessible is your soda rack for these deliveries? Is there existing storage or space to build in storage? Height limitations/code for your roof deck/outdoor patio. This is based on your jurisdiction and considered during the permitting process. Understand what the landlord is providing in their work letter. A lawyer should help review. What kind of HVAC system will work the best for the space? Is there enough flat roof area and structural capacity on the roof for RTU’s (Roof Top Units) or is a Split System going to be used requiring a location outside on the ground for condensers to be placed? 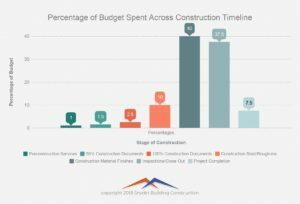 The Budget | Plan for design, consulting, permits, fees, construction, and 10% contingency. “Cost, schedule, and quality—all three are in play but you can only pick two.” – Age-Old Saying. A good starting point for restaurant construction costs in Denver is $130-$225/SF for a 2,500-5,000 sf space. However, this can vary a lot depending on the design choices that you make. Size, for example has an inverse relationship with cost per square foot—the bigger the space, the less cost per square foot. This is JUST construction cost. This pricing does not include architect fees, design, equipment, extensive infrastructure improvements, fine or fancy finishes, training costs, weather/unforeseen conditions or schedule impacts. When you plan your budget, consider all of these costs. In addition, we advise planning a 10% contingency line in your budget—there’s a myriad of moving parts in a restaurant build and it’s just better to be on the safe end. From an interior design/impact stand point restrooms and interior finishes seems like a great place to spend money. And they are! However, big ticket items during construction are often kitchen equipment, wet areas like the bar, lighting in the space, and mechanical, electrical, or plumbing infrastructure upgrades. Signage – own permitting process (start early) design fees, etc. Lastly, spending time and money refining design up front before construction starts saves time and money at the end! Changing design elements in the field after construction has begun can easily triple costs for the changes in no time. The Schedule | Varies greatly! We’ll dive deeper into scheduling in a separate blog post. For now, we’ll touch on it briefly. For projects roughly 2,500-5,000 SF in size you’re looking at about 12-14 weeks of construction time. You’ll want to add surveying, planning, design, permitting, etc… to get a true sense of your timeline. This could add anywhere from 8 to 12 weeks on the front end. Additionally, the exterior signage process has its own permitting and timeline process outside of the construction timeline through local zoning departments. The 12-14 week construction portion will run somewhat like this ….. 1-2 weeks for underground plumbing and electrical work (Another reason having solid MEP drawings and information at the beginning is critical! We can’t start without this. ); 3 weeks framing/rough-ins; 3 weeks equipment installation/overhead; 4-6 weeks for paint, tile, lighting, and finishes throughout. Note, permitting jurisdictions will not allow you to move in furniture or train staff in the space until a health inspection, and final building inspections are completed. If the space is a change of use, or a new space, a CO (Certificate of Occupancy) will also need to be obtained after final inspections. Unfortunately, this is an absolute so you’ll want to plan building your team and training staff for operations accordingly. Check back soon for Part II for more budgeting, pricing, strong mechanical, electrical, plumbing drawings, and designing for efficient service! Ready to learn more and get to work with us?? Email info@snyderbuilding.com or call us at 720.900.5082.